The organizational structure of the fire department is best understood by reference to the organizational chart for the Fire District. However, the organization is generally described as managed overall by the elected policy-making and governing body, the Board of Fire Commissioners, whose policies are implemented on a day-to-day basis by the appointed Fire Chief/Administrator. The Board and the Chief are aided in accomplishing the mission of the department by an appointed District Secretary, whose primary duties are administrative, including maintaining Board meeting minutes and records. Various fire service officers, firefighters, emergency medical technicians (EMTs), volunteer firefighters, and other staff round out the district’s work force and accomplish the delivery of vital services to the public. It’s my duty to serve the citizens of the Chelan area to the best of my ability to ensure Chelan Fire and Rescue remains a superior fire department. I believe serving the community is an obligation in exchange for getting to live in the best place on earth. 32 years in banking as a commercial and consumer loan officer and Branch Manager. 14 Years teaching sailing as a certified instructor. Small farm operator growing nuts and berries. Personal Information: Russ grew up in Wenatchee and has been living in Chelan since 1984. Russ was a founding member of the Lake Chelan Nordic Skiers and the Lake Chelan Sailing Association and is a current member and past President of Rotary. 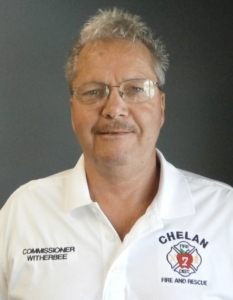 Phil was elected Chelan Fire and Rescue Fire Commissioner in November 2017, starting his 6 year term January 1, 2018. 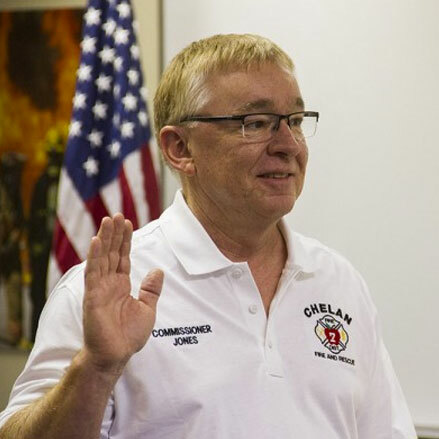 Phil felt a strong obligation to the Chelan community where he is from to take on the responsibility of Fire Commissioner representing all the people within Fire District 7. Phil moved to Chelan with his family in 1967. In 1975 he joined Chelan County Fire District 7 where he began his fire career. 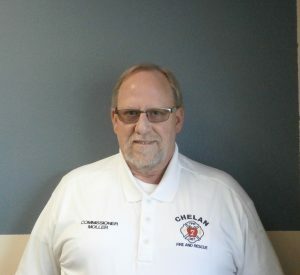 After 7 years with the Chelan County Fire District he moved to Western Washington to continue his career with King County Fire District 36 in Woodinville. After 29+ years in the fire service, both Wildland and Structural Fire he took the opportunity to move back to the family home in Chelan and give back to the community. Graduated from Chelan High School 1976. Attended Wenatchee Valley College. Took and instructed many Wildland and Structural courses over the years. Anything family, Member of Rotary serving as a director for 2 years, Most sports hockey in particular, helping the community when possible, travel. Commissioner Moller was born in Spokane Washington in 1958 before moving to Chelan in 1967. Jay Witherbee was appointed by Chelan County Board of Commissioners. The oath of office was taken June 13, 2018 at Chelan Fire and Rescue Commissioner’s regular meeting. Commissioner Witherbee appointed position will expire November 2019.